The Sony Alpha A7s full-frame digital camera combines a 12.2MP full-frame CMOS sensor with Sony's powerful BIONZ X image processor to deliver unrivalled sensitivity and exceptional low light performance. Designed to meet the needs of the serious photographer and videographer, the A7s (s' stands for sensitivity) offers an ISO range up to 102,400, which is expandable to 409,600, and the option to output 4K video to an optional recorder through its HDMI port, without the need for line skipping or pixel binning. Further to the above, it delivers Full HD 1080p recording, Wi-Fi/NFC connectivity, a fast 25-point contrast-detection AF system, a 2.36 million-dot XGA OLED Tru-Finder and a 3.0" 921.6k-dot tiltable LCD monitor. Battery NP-FW50, AC Adaptor, Battery Charger BC-TRW, Cable Protector, Shoulder Strap, Body cap, Accessory shoe cap, Eyepiece cup and Micro USB cable. 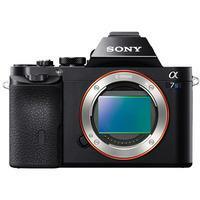 Sony Alpha A7S Digital Camera Black (Body Only) + EXTRAS! !